Required reading doesn’t have to be all work and no joy. As in the case of The Sower, Slide:ology I greatly enjoyed. 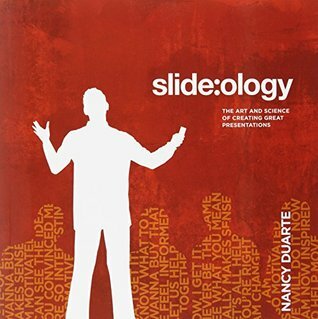 Nancy Duarte gave me insight in how I can use Power Point to tell story, show data, and make impact. The case could have been made that reading this was unnecessary since I have been doing Power Point presentations for about eight years at my day job, but new techniques sharpen the mind. So my top five takeaways? Pictures evoke emotion and tell a story. More pictures, less words was what she recommended. The presentation supports the person. The person doesn’t support the presentation. Font is important. Take the time to seriously consider the kind of font to use in a presentation. Data doesn’t all have to go on the one slide. Make the data easily manageable using simple graphs or simply a picture with a percentage. Mini-presentation. The one thing I plan on doing is creating a small presentation to keep on my phone and tablet so when people ask me questions on the spot, I can whip out my tablet or phone to show them pictures during the natural conversation. She relayed a story of someone wishing to raise money for building fresh water wells in Africa who had a short presentation ready on his phone to support his conversations. The mistakes people make are too much text on a slide, the slide having too much information too quickly so the audience reads ahead of the presenter, and how people make the information hard to digest. Like writing a story, moving a paragraph makes all the difference sometimes, and in presentations, filing the information down to key words and pictures make a more emotionally appealing presentation. During the reading of this book, I have folded corners, circled key things, and generally made notes on the pages. It will be in my reference library for future presentations.